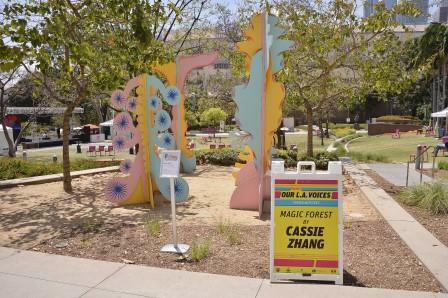 Saturday, April 27, 2019 and Sunday, April 28, 2019; 11:00 a.m. – 5:00 p.m. Grand Park’s week-long spring arts experience, Grand Park’s Our L.A. Voices – L.A. Arts Festival, is a regional arts gathering that focuses exclusively on the diverse and powerful artistic talent in Los Angeles County. Envisioned as an annual “best of L.A. arts festival,” this free, two-day performing and visual arts showcase will bring dance, music and theatre performances, as well as visual artwork by L.A. artists to Grand Park. The festival’s 2019 theme, Origin Stories, explores and showcases distinctly Los Angeles narratives and questions about where we are, how we got here and where we are going. As part of Grand Park’s Our LA Voices – L.A. Arts Festival, Grand Park will offer free workshops on creative practice, as well as the pragmatic side of making art in L.A. Topics range from street dance activism and acting, to intellectual property and copyright protection, marketing, entrepreneurship skills and fundraising. These workshops are open to all and require pre-registration.